My favorite flavor on the planet is Strawberry Banana. Whether it be candy, yogurt, or a smoothie, I can’t get enough of this flavor. When I was asked as a part of the Walmart Moms if I’d like to try out the new Yonanas Frozen Treat Maker, I immediately said yes. Why? Two words….Strawberry Banana. 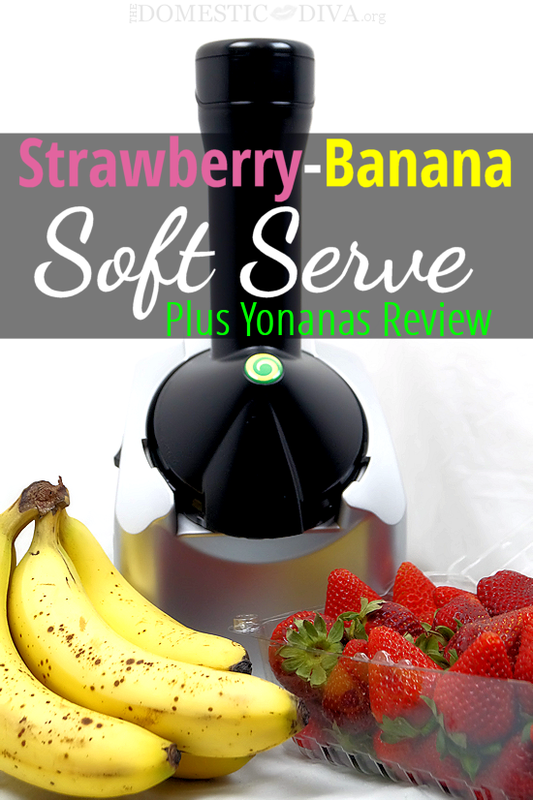 Since my favorite dessert to indulge in at home is strawberry banana frozen yogurt, I knew that upon receiving the Yonanas that I wanted to try my hand at making my own frozen strawberry banana soft-serve. Since Yonanas uses only fresh, frozen fruit I knew that it would be a healthier alternative to some of the other sugary desserts I typically grab after dinner. So once the Yonanas machine arrived on my doorstep, I headed to my local Walmart to pick up some fruit to make my own dessert at home. Yonanas is a machine that turns frozen bananas into soft-serve like frozen dessert that resembles ice cream. My family and I love fruit, we try to have some sort of fruit in the house at all times even if it is just bananas. Fruit is such a great quick and easy snack to grab between meals and now is an added bonus for dessert. 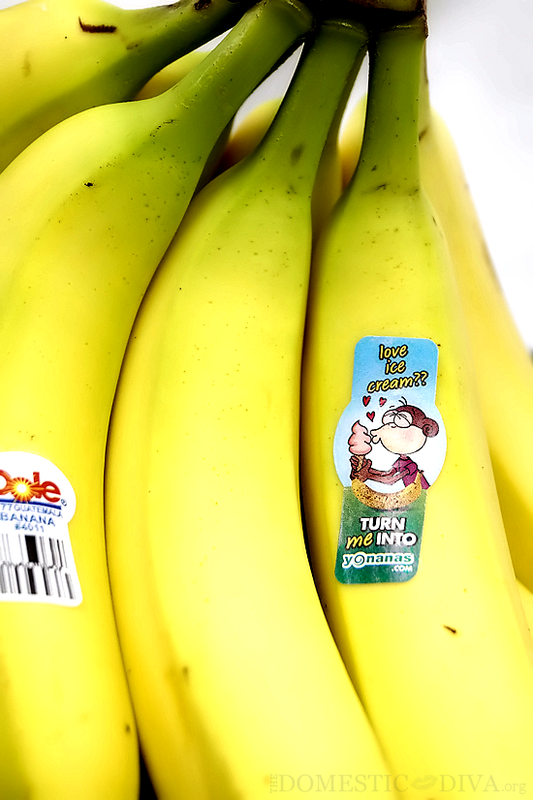 When grabbing a few bunches of bananas at my local Walmart I noticed the sticker on the bananas that said “Love Ice Cream? Turn me into Yonanas!” which is exactly what we were going to do. 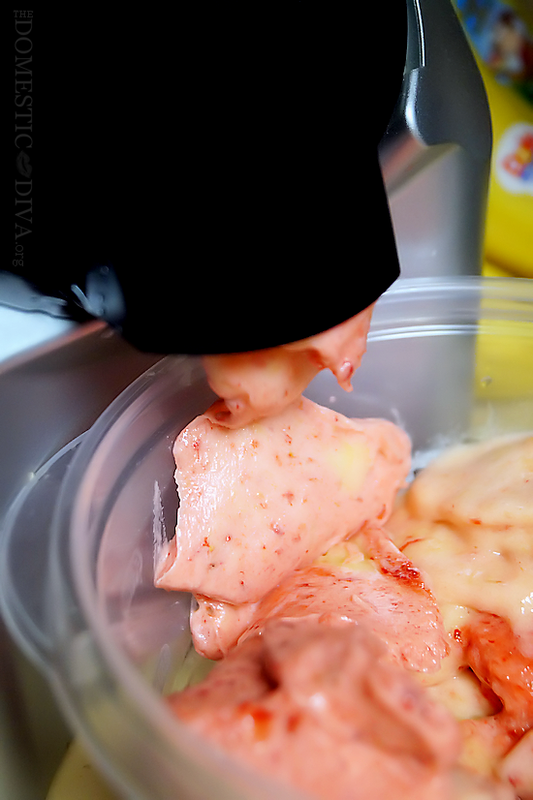 Before making a Yonanas frozen dessert there is some prep work that needs to be done. First, you have to freeze the fruit that you are going to be using. To make it easy to serve up individual Yonanas desserts, I first took individual plastic container bowls, filled it with 2 peeled over-ripened (look for cheetah spots for the sweetest flavor) bananas and another complimenting fruit like strawberries. 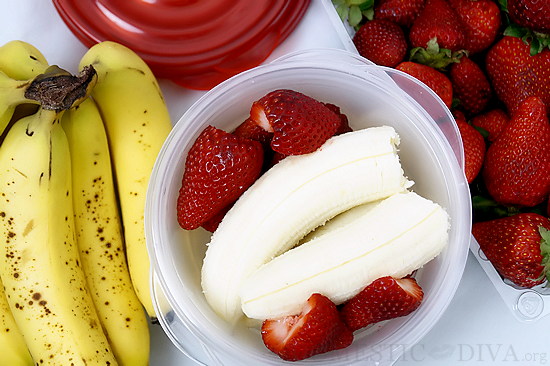 Cover and place this container in the fridge until bananas and additional fruits are frozen. Freezing individual containers of fruit makes it easy to make individual portions of Yonanas frozen desserts later. Plus since I froze our fruit in bowls, the container can also be used as our serving dish once the fruit is turned into Yonanas. Once the fruits are frozen and you are ready to enjoy some delicious Yonanas soft-serve, remove the fruit container from the freezer and let it thaw on the counter for about 7-10 mins, this is to ensure that the fruit isn’t too difficult for the machine to turn into soft-serve. 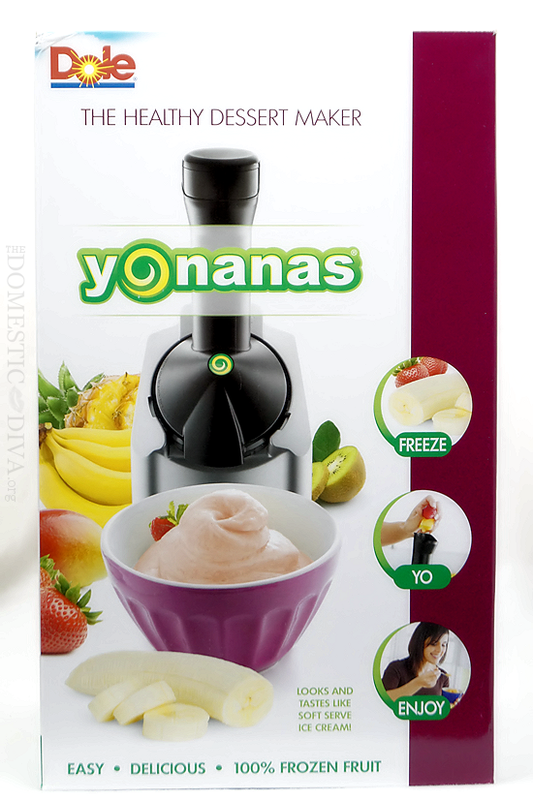 Once thawed for a few minutes then it is time to start making your own custom Yonanas dessert. Insert a piece of frozen banana into the Yonanas shoot and press down with the provided plunger, continue doing this alternating between banana pieces and other fruit of your choice. Since I’m making a homemade strawberry banana soft-serve, I alternated between bananas and strawberries but any fruit combination can work like frozen melons, pineapples, and berries. After feeding all of the frozen fruit through the Yonanas machine your custom soft-serve dessert is ready to enjoy. The consistency is like soft-serve ice cream with the fresh taste of fruit. This small appliance is great for those that have an allergy to dairy as one can control what ingredients are used to make a soft-serve like dessert at home. If you love smoothies then you might like Yonanas. I like how it can be customized for each individuals taste preferences. My oldest son preferred less of a banana taste so we added more strawberries to his Yonanas while my youngest liked equal amounts of banana and strawberries. Even though I love the taste of just strawberries and bananas I also found that I really liked adding frozen fresh pineapple to my Yonanas mix for a more tropical strawberry banana frozen treat. The flavor combinations are endless and I love how the key ingredient is bananas which is something that we always seem to have on hand at our house. The Yonanas Frozen Treat Maker is available at Walmart for $49.95 and comes in a variety of colors to match your kitchen. I love that red color, I think it would match my other small appliances perfectly! I’m already trying to figure out a permanent place to display the Yonanas Treat Maker on my countertop as I can see that this will be used quite frequently in our home as a quick dessert to make with and for the kids. Now that our favorite fruits are back in season for spring, I plan to stock up and freeze all of our favorite berries and melons to enjoy some frozen treats throughout spring and summer. Since Yonanas frozen treats are just fruit it can be enjoyed any time of day. During the hot southern summers, I think a Yonanas frozen treat would be great for an afternoon “cool down” snack or even breakfast! What is your favorite fruit combination? Disclosure: As a participant in the Walmart Moms Program, I've been compensation for my time and efforts in creating this post as well as provided samples of the products mentioned in this post. All thoughts and opinions are my own. My experience may differ from your own.